A Chesterfield psychiatric unit has taken action after a detained patient escaped from the site and took his own life. Michael Mapley was found dead in a field three days after going missing from the Hartington Unit in July 2016. 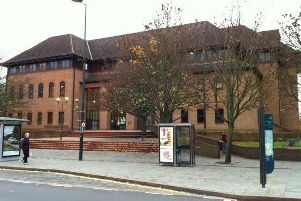 A jury inquest, at Chesterfield Coroner’s Court, concluded that the 43-year-old died from suicide by hanging and that his death was ‘influenced’ by his mental health issues. The court heard that Michael set fire to some papers in his dormitory on July 10 2016- triggering the ward’s fire alarm and opening an automatic fire door, allowing him to escape. On July 13 he was found dead by a workman behind Lodge Farm in Calow. Summing up evidence given over the four-day inquest, assistant coroner for Derbyshire Peter Nieto said Michael was ‘one of a number of patients’ who had managed to escape the Hartington Unit, part of Chesterfield Royal Hospital, via a fire door. Since his death, hospital bosses have made a move to improve security and the unit’s missing patients policy- installing CCTV camera at all fire exits, ensuring assessment are easier for staff to access and providing additional training. The jury found further areas for concern- such as the fact Derbyshire Police failed to conduct a 300-metre search radiating from the centre of the unit grounds after Michael went missing. They also found that unit staff did not pass on all relevant information regarding Michael’s risk level to police officers. However, there was ‘no evidence’ to suggest any of this had contributed to his death. Michael was admitted to the hospital in June 2016, suffering from paranoia, ‘auditary hallucinations’ and sucidal thoughts. Over the course of his stay he had self-harmed and constantly wore headphones to ‘block out the voices’, but staff said they ‘had had no reason’ to believe he would take his own life. Michael received a visit from concerned mum Olwen Mapley days before he went missing, and seemed ‘happy’ and was ‘making plans’ with her. Though a troubled character, who struggled with alcohol and psychoactive drug abuse, Michael was described by his family as a ‘free spirit’ who loved travelling, camping and hiking in the Peak District. He was a ‘very independent’ man who had attempted to conceal his mental health issues from his loved ones. If you’re feeling like you want to die, it’s important to tell someone. Help and support is available right now by calling one of the helplines below. You don’t have to struggle with difficult feelings alone.